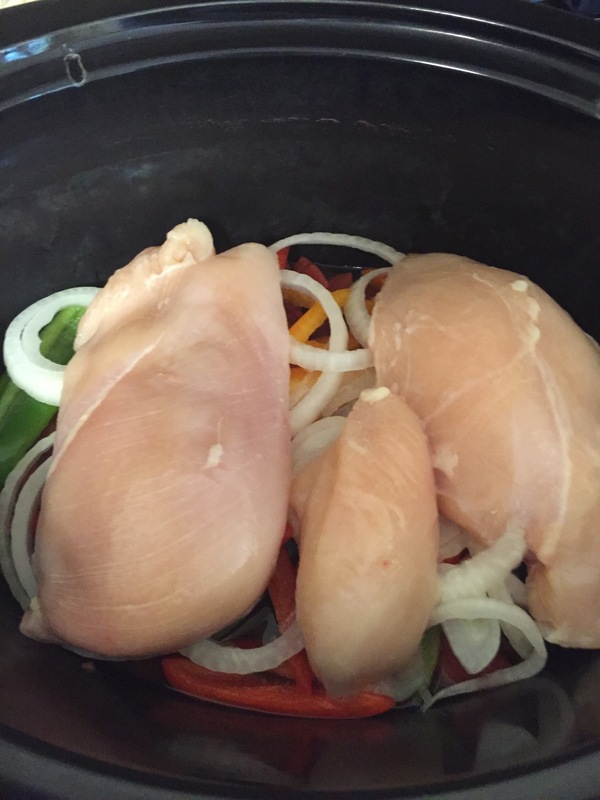 Slow cooker chicken chili and isn’t it ironic? So everywhere I look here lately on social media are recipe videos. They are neat to look at but if you are any kind of a cook, you know very well no recipe is that simple. Pretending it is by making a time lapsed video is not going to make it so. While I appreciate being up with the times and rolling with what is popular, I am mostly all about tried and true. At the end of the day, I want a recipe. Not a video. Real recipes, no matter how simple, require real effort. I suppose what I am saying is that those videos are somewhat of a pet peeve of mine. I am a cook. I do cook. I take it seriously and I also know that most recipes require some effort. It would be lovely for it to be that simplified and my vegetables are chopped with a hit of a fist like one video showed and my spaghetti boiled in 2 seconds. I really hope anyone out there knows that is not happening. BUT, many of those dishes they prepare on those lala land videos look amazing! I will not lie. Mouth watering. So I get the attraction. And this chicken chili did not disappoint!! No sir-y Bob! But it take me longer than 5 minutes to prepare. Ha ha!! My friend Misty is a Norwex distributor and she came to my house to show us the awesomeness that is Norwex. I had a few friends that came and I made a crockpot full of this chili. It was amazingly tasty. No doubt! If you have any interest in cleaning your home faster and with less product, you can check out Misty’s business page here…http://mistylee.norwex.biz. My favorite products are the envirocloth (you have to see it to believe it! ), the window cloth, and the envirowand. Anyway, there is nothing I love more than a fun party, some good friends over and feeding them some delish food!! We had a good time even with just a few of us there. 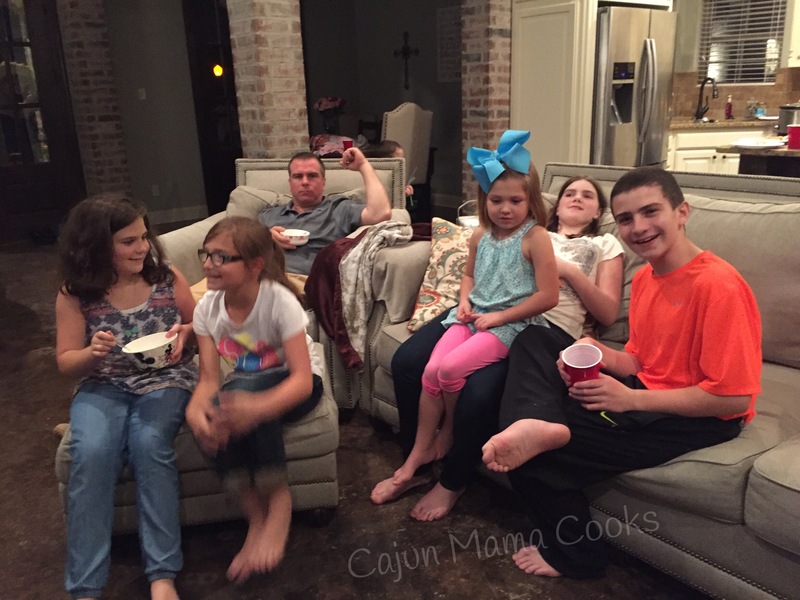 Then again, most times in Cajun Mama’s kitchen are good times, if I say so myself!! Ok so here’s the super easy crockpot chicken chili recipe. You will love it, your kids will love it, your friends will love it, even if it takes longer than 5 minutes to make. It comes from http://www.12tomatoes.com and they actually had a written recipe conveniently attached, so that’s the best of both worlds!! And I went to look on my phone for pictures of this delish dish and I did not find any! I feel positive I took some but somehow they are not there. So that means I either did not take any (rare) and I am losing my mind OR I took some and they got deleted from my phone. Either explanation is plausible. So I apologize for this rare occurrence but this recipe is worth posting even without pictures. I just know many of my readers are visual people and like some pretty pictures accompanying their recipes. It won’t happen again…until it does. Because I have 4 kids and they get ahold of my phone sometimes and who knows what happens. But luckily the link I gave you has some pictures and a video. Oh the irony…I dislike recipes that come as a video only and I have no pictures. 😂😂😂 I guess Alanis Morisette was right. Isn’t it ironic? 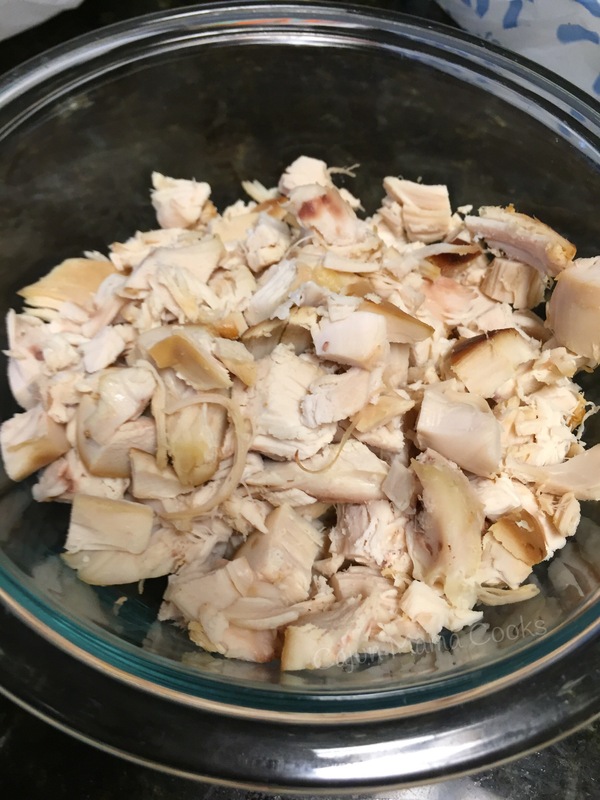 Place chicken breasts in slow cooker. Pour chicken broth over chicken breasts. Add the tomatoes, corn and black beans. Toss the chopped jalapeños, onion, garlic, and red bel pepper on top of this. Sprinkle the cumin, chili powder, oregano, kosher salt and black pepper over the top of this colorful concoction. A picture would be nice here wouldn’t it? Sigh. Ok cook this on low for 5-6 hours or high for 3-4 hours. As I always say, it depends on your slow cooker. Once the chicken is cooked and tender, remove the chicken from the slow cooker and shred with 2 forks. Place back in slow cooker. Give it all a good stir and then add your cream cheese. Cook for another 20 minutes or so on low. 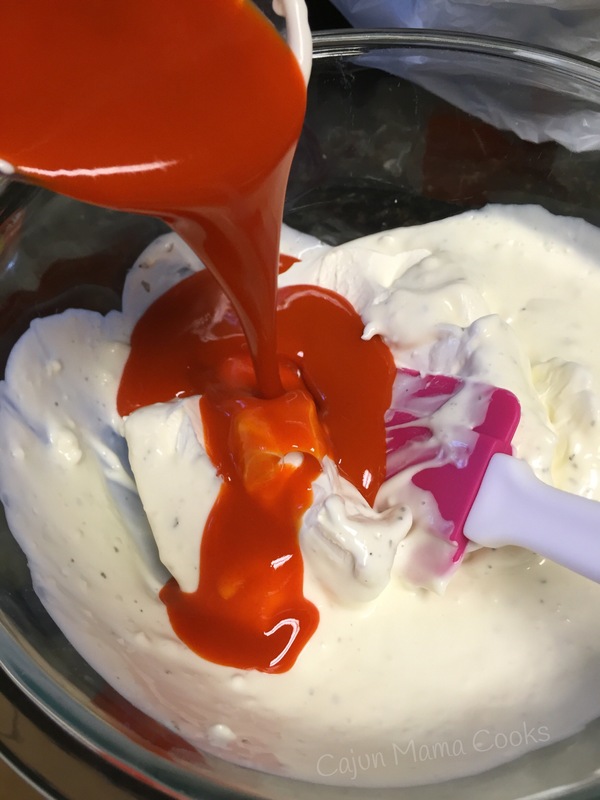 At the end, stir to make sure the cream cheese is evenly distributed. Add a big heaping scoop to a bowl along with crushed tortilla chips, shredded cheese, cilantro and sour cream. Oh so good!!! You can’t eat a picture anyway. But this…oh yeah my baby, dig in. Well…The holidays are over now and we have to find a way to go on. Sigh. I love the holidays. The anticipation of it all is what makes me the happiest. Must be the Catholic in me. I love the whole build up of Advent, the build up to the big event and even afterward as we wait for the epiphany. So after it is all said and done…I feel a little let down. Yes, I know that what was supposed to happen has happened. But it’s a little like “blah. Now what?” My sweet Madame toot (9 years old) said it perfectly on Christmas night. “Christmas is over. How can I go on?” I about died laughing because I could so understand how she felt. So now the kids are back in school and life is back to “normal” (lol! As if!) and it’s all about establishing routine. Getting back into our groove. But still…in the humdrum, cold and wet weather, a mama needs a little something to look forward to. A little treat here and there. But after the buffet of gifts and food and indulgence at Christmas…who has money for that? We are all looking to make resolutions, cut corners, get stuff in order, organize…and the list goes on. Well here comes me. And my gang of pals who always know which direction to point me in. I met a new friend recently…well she is married to an old friend and we finally “met.” She is hilarious and apparently knows good things when she sees them. She did marry Wade after all. Yes this. She was so dead on. Posting a picture on Facebook with a thumbs up sign. Yes Connie. So much yes. I know, I know…this is instant cappuccino. To that I say, maybe…but this is a treat! It’s not expensive and it’s a small what my mom would call…happy. Let’s face it ya’ll…finding little things to break the monotony, help us survive the crazy, brighten up the middle…well those are things to hold on to. A Starbucks coffee a day habit is not in my budget lately. But this…this I can do. On the same note, while at Walmart picking up a report cover for my daughter’s science fair project and my Hills Brothers cappuccino in a tub… I found some super cute Henley’s in a bunch of fun bright colors. Guess what?! These super sassy, won’t break the bank, 3/4 length and feel great on tops, look as cute with yoga pants as they do with jeans or dress pant. Can you say score?! It is truly the little things. So to get on with the story that is leading to a recipe…I promise. On my mind as I entered Wally World today was what am I gonna make for supper? You know that question. Yesterday I saw this on Facebook and since then I have had bacon on the brain. 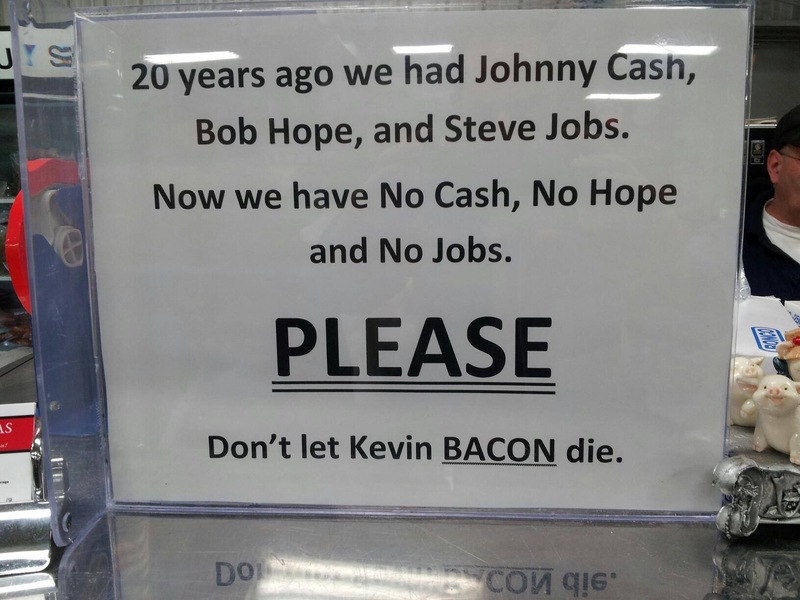 It made me giggle and want bacon. BACON!!!! 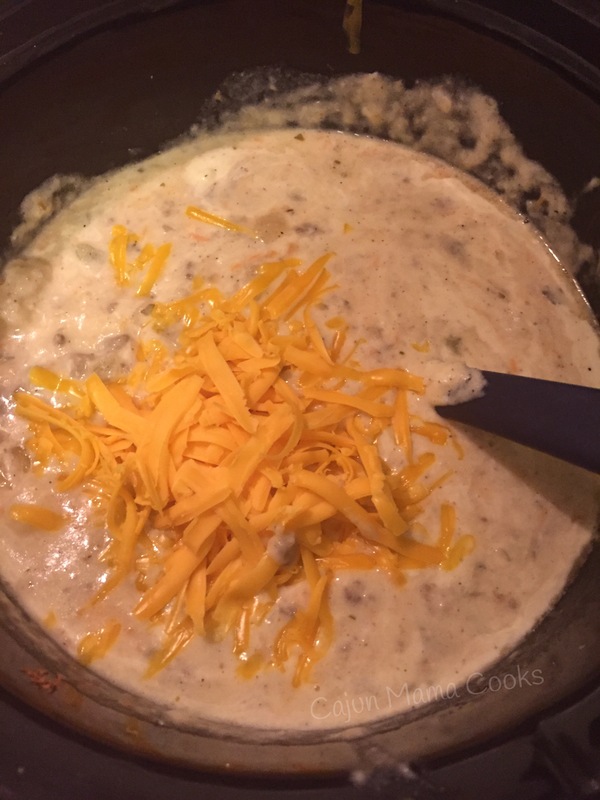 This is what I googled…creamy bacon chicken in the crockpot. 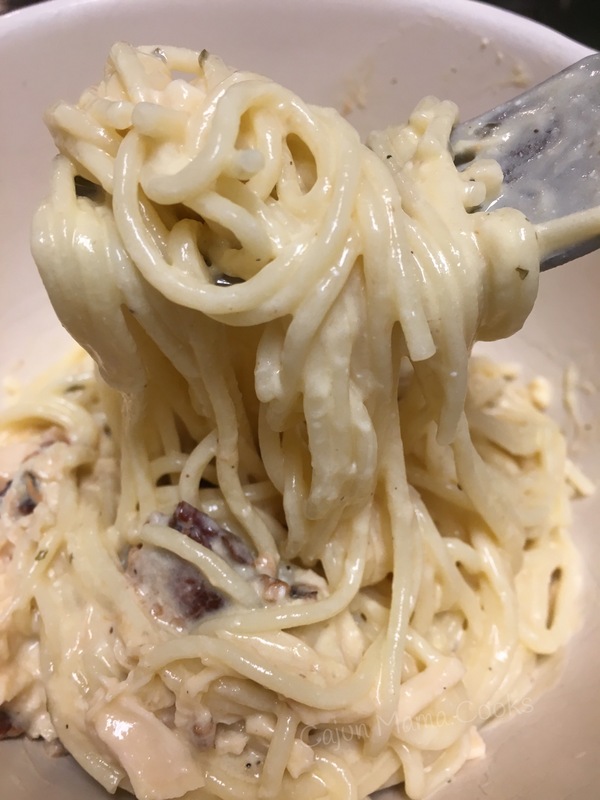 And this recipe popped up…http://www.bettycrocker.com/recipes/slow-cooker-bacon-ranch-chicken-and-pasta/997c0a46-b7d8-481e-8919-5f563b1dde66. 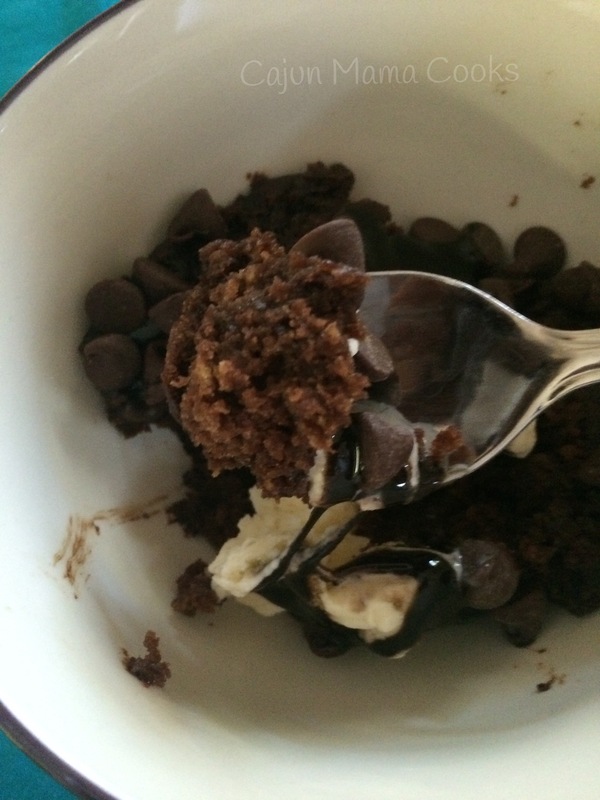 I wanted to try it a while back and well…who knows why but I never did make it. But today it is happening. As I wait in carpool to pick up my oldest from middle school before heading to the other school to fetch the other 3…it is cooking away in my little crockpot. Or big red as she has been dubbed. She has a timer and is set for greatness. Chicken bacon ranch pasta. Happening tonight. Making something indulgent for supper that I did not have to slave over is definitely on my list of little things that make a big HAPPY difference in my life. So to sum it up…things that make me happy…instant cappuccino, colorful versatile shirts, and a good easy creamy pasta recipe. Throw in my soft cozy flannel dachshund sheets on my head and a nice cold snap and this chick is HAPPY! This pasta dish made me oh so happy!!! It is absolutely fantastic. The flavor is simply divine. It is super indulgent, yes. But after all the delicious rich foods we indulged in during Christmas, we cannot send our bodies into shock. A little indulgence here and there is necessary. In my humble pasta loving opinion. You know how some recipes don’t live up to the hype? And like the after holidays let down, you just feel a little empty inside? Yeah this is not like that. I had to force myself to stop eating it. I am hoping the leftovers will be even better since the flavors have had time to blend. We shall see. But for tonight…I am a happy happy girl! The kiddos truly enjoyed it! Victory! 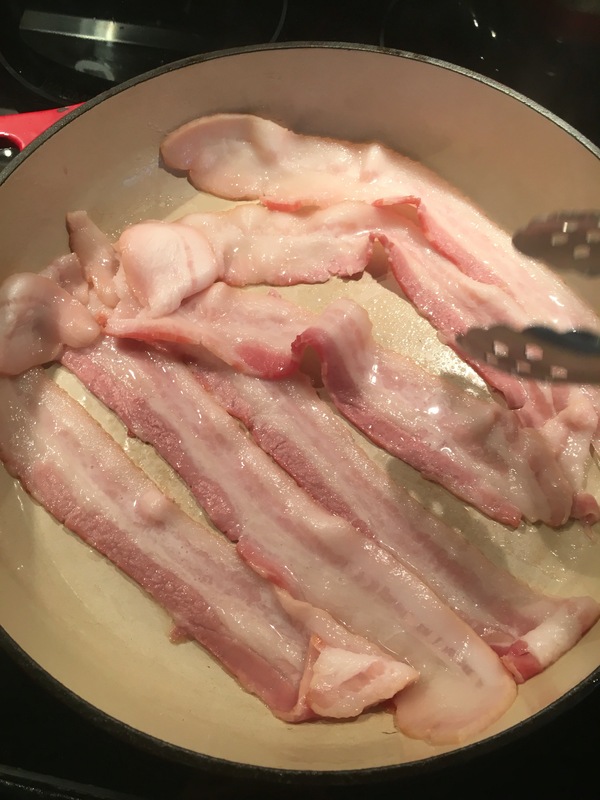 well if you have not yet, fry your bacon. Bacon good. Then you want to spray your 4 quart crockpot with cooking spray. Then lay your chicken breasts in the crockpot. Tell them to sit tight. Then combine all ingredients except pasta in a bowl. Mix well. 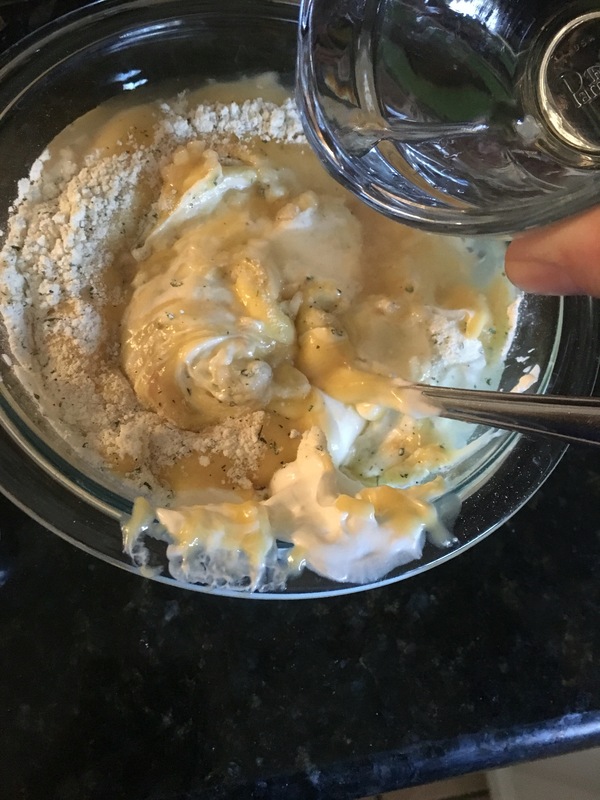 Then you want to pour this mixture on top of the chicken breasts. Cook on low for 3-4 hours or so. I let mine just turn off and then it was on low until I was ready to add pasta. Also, shred the chicken breasts before adding the pasta. Once pasta is cooked and drained, add it to the delicious sauce in the crockpot and gently stir to combine. Then just serve it warm. My crockpot has a warm button, so I just it on until we were ready to eat, even once I added pasta. It’s been so hectic around here lately. I keep saying it will slow down but it actually seems to be picking up momentum. Like a slow train running. I have said this before in previous posts but I know a major part of being at peace is just accepting the frantic pace and finding time to have as much fun as possible with my family. Spending time together and savoring every moment. So recently some friends of ours moved into their newly built home and wanted to have a house warming party. Chris works with Big Daddy at Farm Bureau and they have become good friends. Naturally our kids are friends and his wife and I are friends. 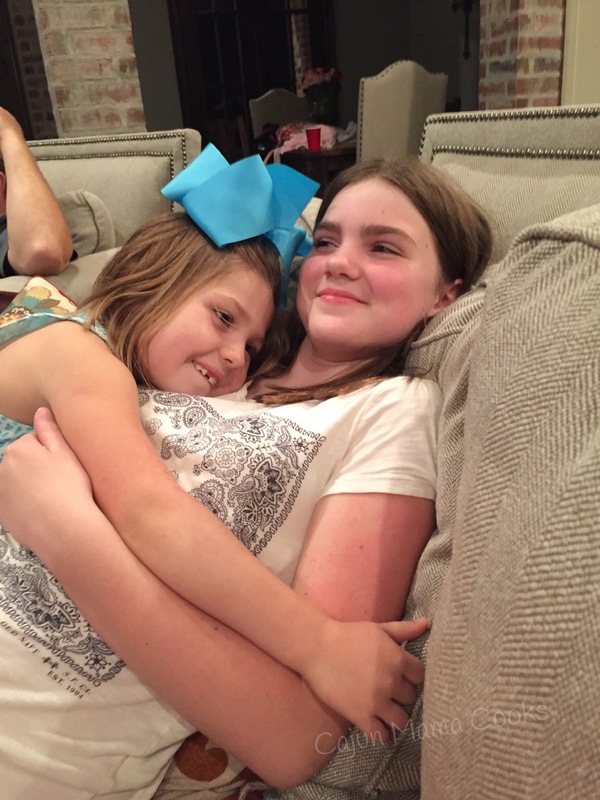 Everyone who works in that little office in Desoto Parish and their families have become a little family. 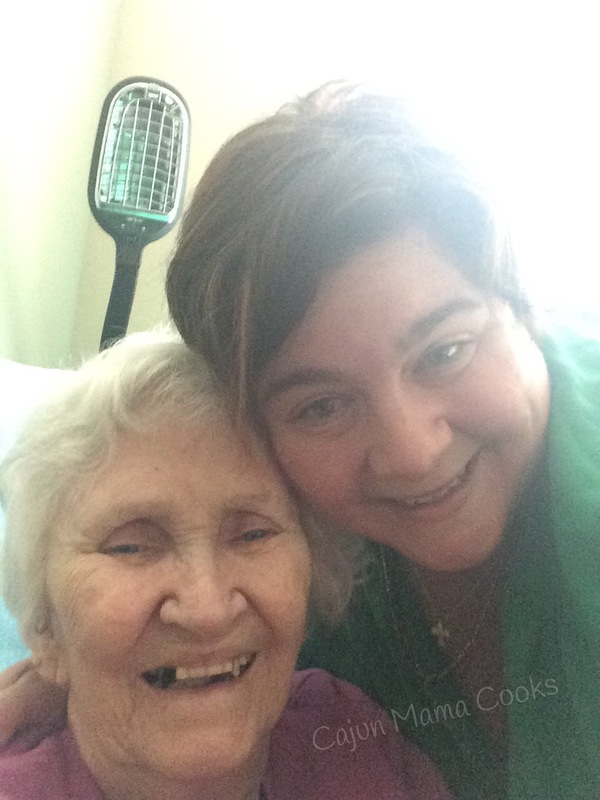 With Loretta (corn salad Loretta if you recall…read it here…Corn salad recipe) being the wacky aunt everyone adores. But that night of the housewarming get together, I was just not feeling it. I was past tired and careening rapidly towards exhausted and cranky. Over it. 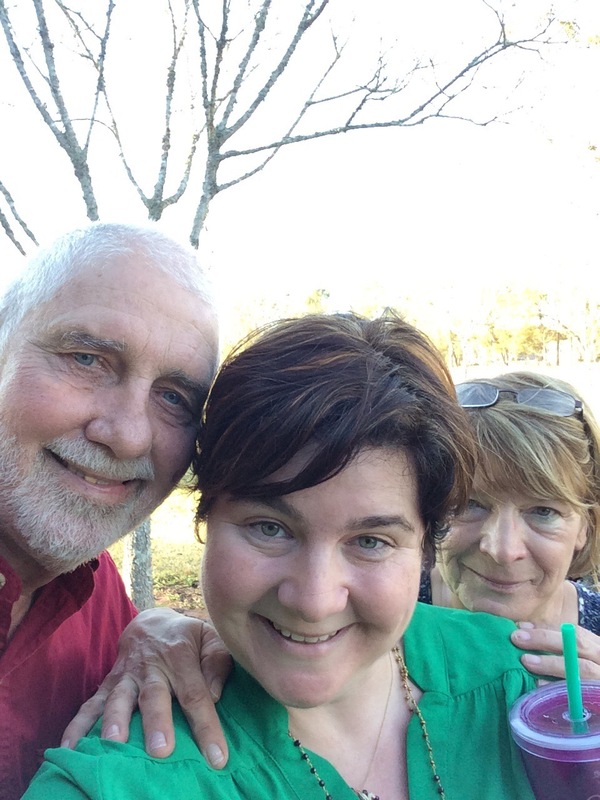 But we had committed and I knew we needed to be there…so we went. 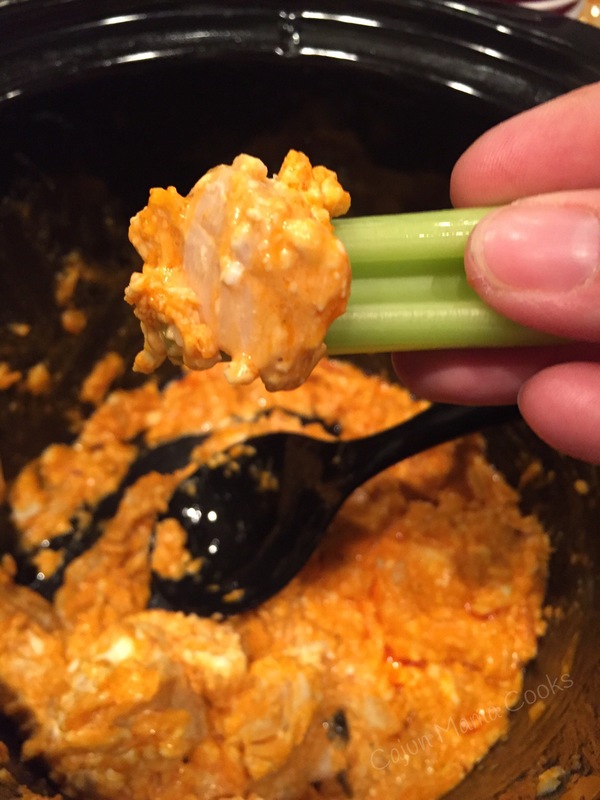 With my slow cooker full of this warm, bubbling buffalo chicken dip, chopped celery sticks and big bag of Ruffles. 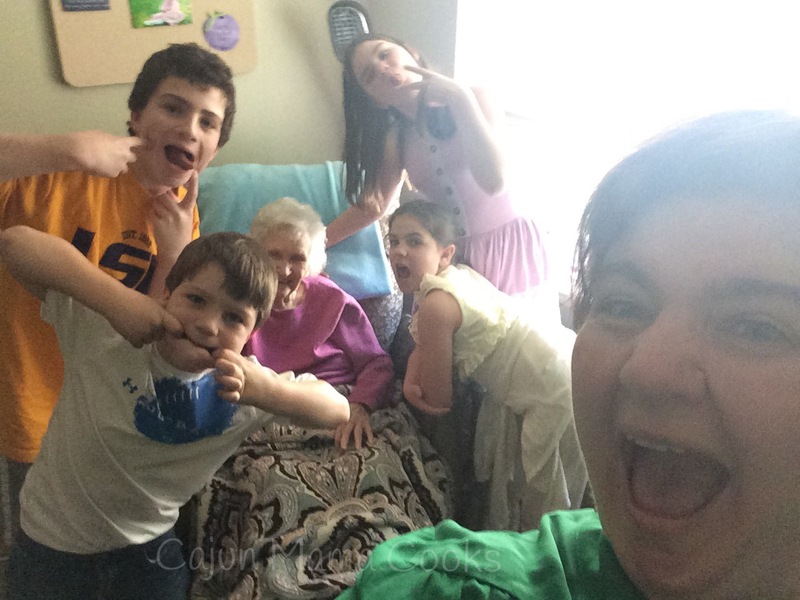 Wacky aunt Loretta had lined us all up about what to bring and played the role of party planner. I had said I would bring chips and dip at the time but at the last minute I decided I would bring one of my favorite dips that my sister, Claire, had introduced me to years ago. 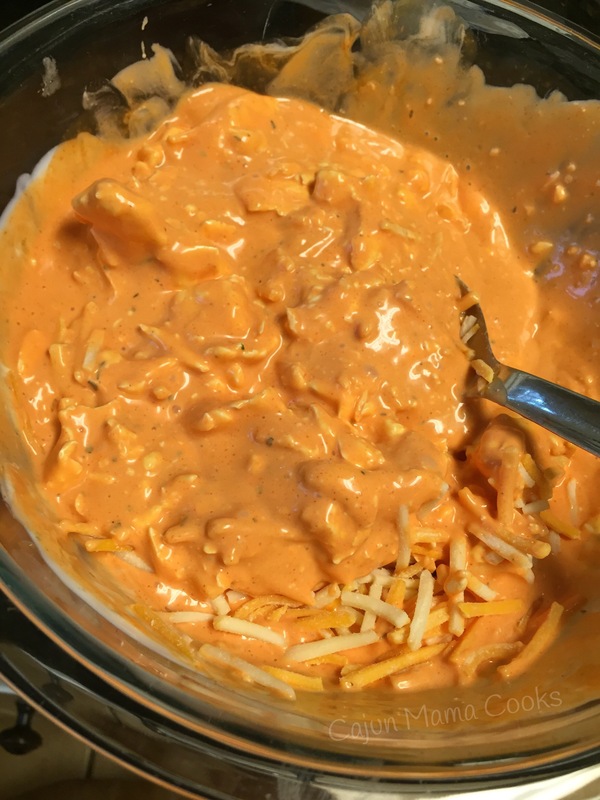 Yes, this buffalo chicken dip is one of my favorites and it was a big hit that night at Chris and Sarah’s. I ended up being so glad I bucked up and went. That I got over my exhaustion and was able to see past the long week and embrace a Friday night with good friends. See in my exhaustion, I had not counted on lots of laughter, or Kelly (who would be the fun indulgent aunt) bringing us all big ole daquiris (thanks Kelly! ), or the hilarious conversation. I had not factored in feeling right at home and being able to just sit on a stool and laugh amongst friends. It’s easy sometimes in the haze of being annoyed and tired to forget the fun stuff. So it ended up being a fabulous night. And the buffalo chicken dip was enjoyed by all. But not as much as the daquiris, Kell. We always have too much fun together. In fact, Sarah and I have decided it is going to happen more often. Oh and their new house is absolutely gorgeous! In the end, what makes a good time are the people around us. We have that down pat! my fave! I could drink the stuff. 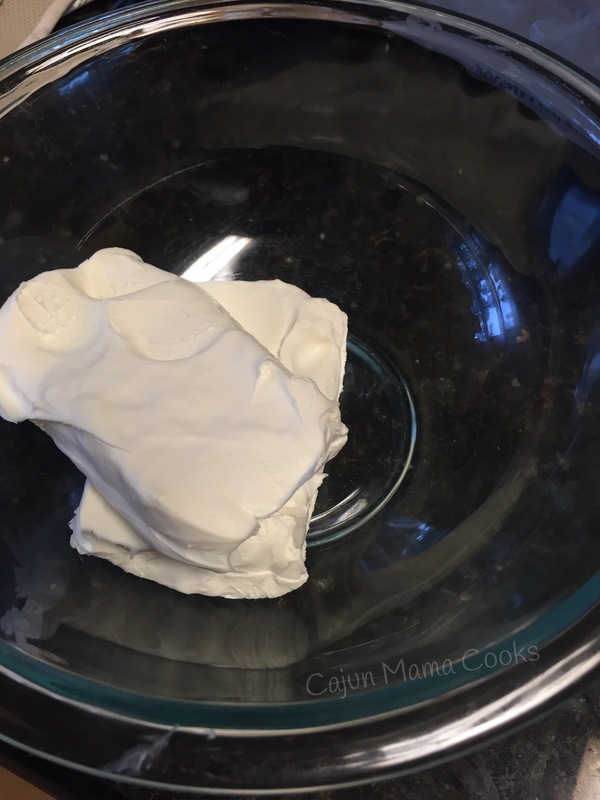 In a smallish crockpot (think 3.5 quart), add your softened cream cheese. Next pour your dressings over this. 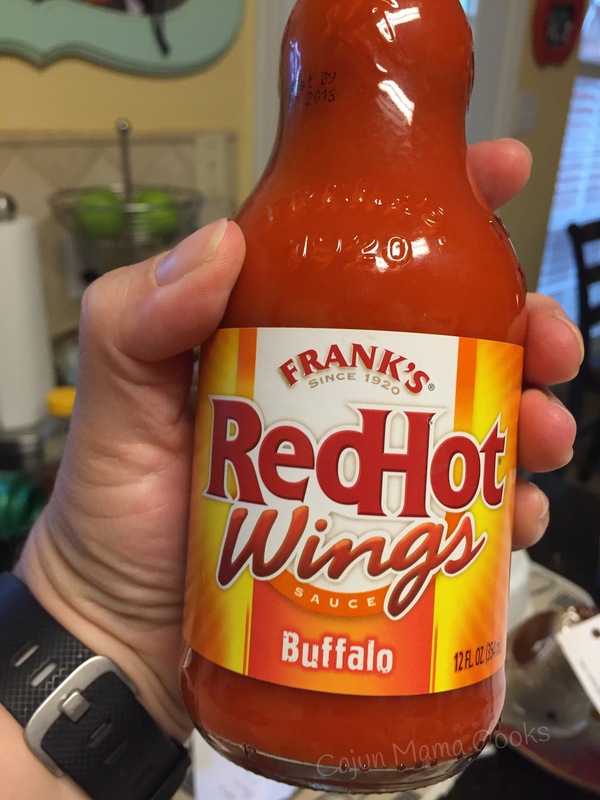 Then add your essential ingredient…the hot wing sauce. Just kind of give it a stir. 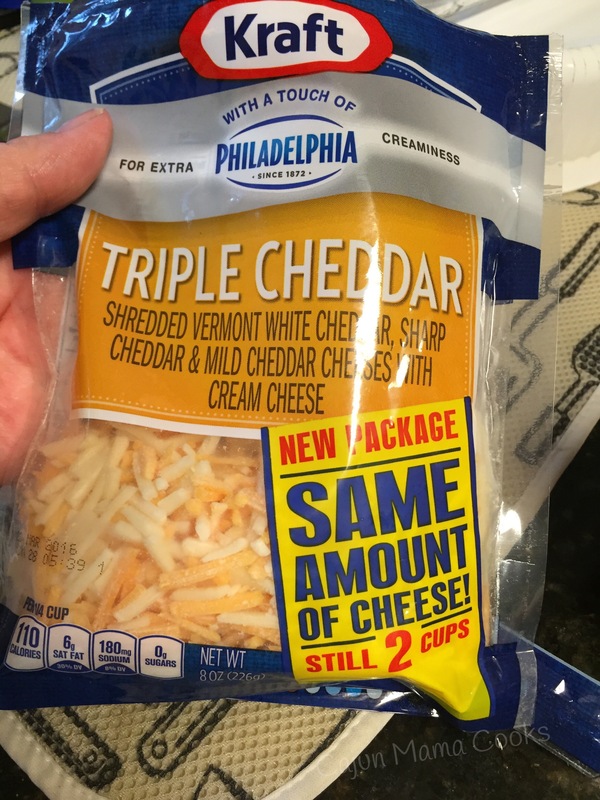 Sprinkle in half the cheese…so 3/4 cup or do what I do and add half the bag. Go big or go home I always say. That’s the kind I use…that little hint of cream cheese creates a sense of nirvana in this dip. Just an over the top, “yes this dip, just yes” feeling. You know? Now stir in your cut up cooked chicken. Set it to low and cook for about 2 hours. Lift the lid and give it good stir halfway through. And sprinkle the rest of the cheese on top. It will melt the cheese and it will be buffalo dip perfection. How I love this dip. It’s just fabulous. So with the holidays coming or for when, you know, LSU plays Bama this weekend, keep this dip recipe on hand. You will want to make it. Don’t forget the daquiris!! 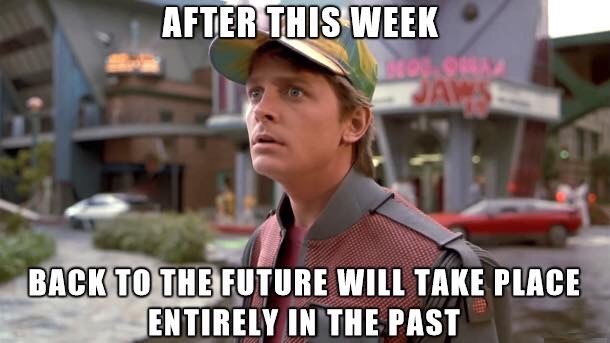 Did you know that today is back to the future day?! 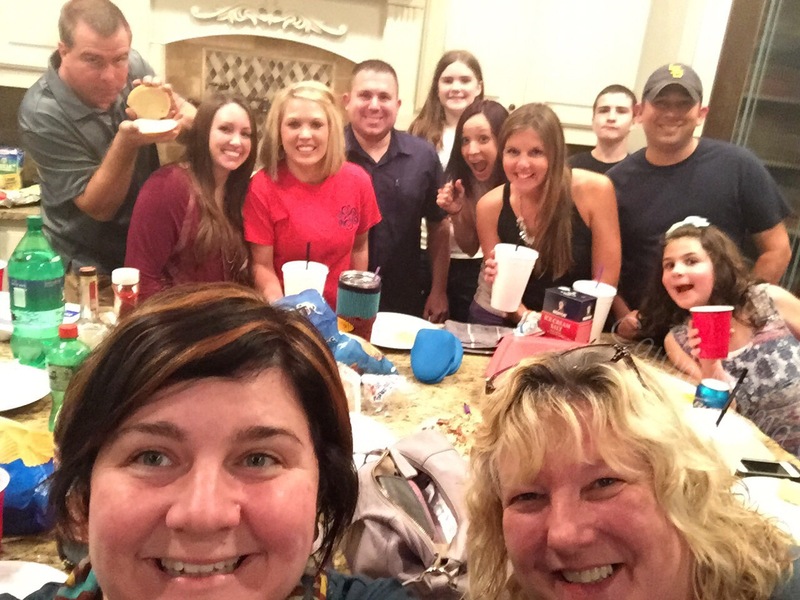 Yep, that day that was on the time machine in the movie….OCTOBER 21, 2015. When I saw this on the news and realized what was up, my very tired mind was effectively blown. We are in the future. The future, according to the movie, is now! the truth in this meme will boggle the mind!! I love to share some 80’s culture with my kiddos. 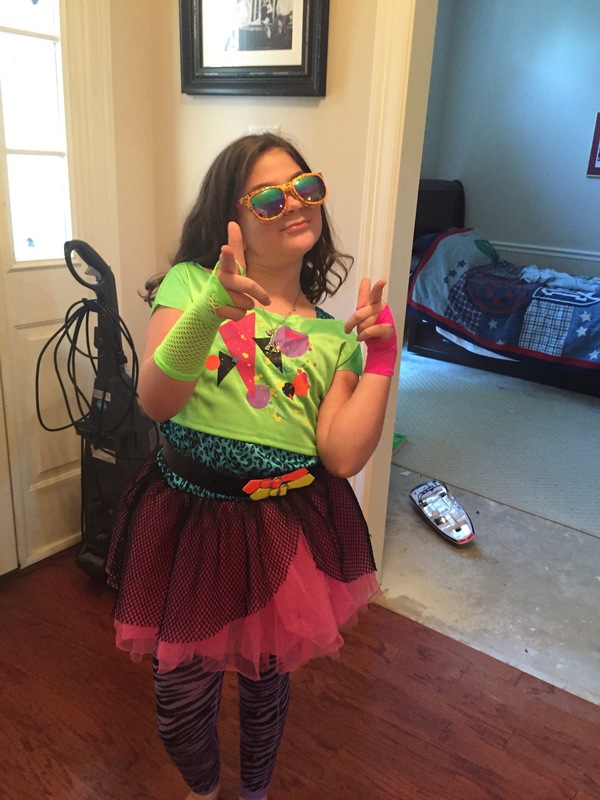 When my sweet ADB chose this as her Halloween costume, I was beyond thrilled! So we definitely bring some 80’s flair with us wherever we go. We watch The Goldberg’s every Wednesday night. 80’s on 8 in the car, yes! Until they get enough and ask to hear some T. Swift. And I cannot complain since her newest album, eh em, I mean CD, very much gives a nod to the 80’s. It is called 1989. Music to this mama of tweens and preteens ears!! Bliss!! So to say that today is something to celebrate even just a bit in this house is a bit of an understatement. But truth is, and ya’ll know it, I look for stuff to celebrate. Big Daddy loves fajitas and here lately whenever I ask what he wants for supper, he says fajitas at home. We have figured out how to make some really awesome homemade fajitas on the grill but on a night when I want to get homework and baths done so we can indulge in family movie night, that seems like too much work. Or maybe because I have had sick kids at home for a week and I am tired. 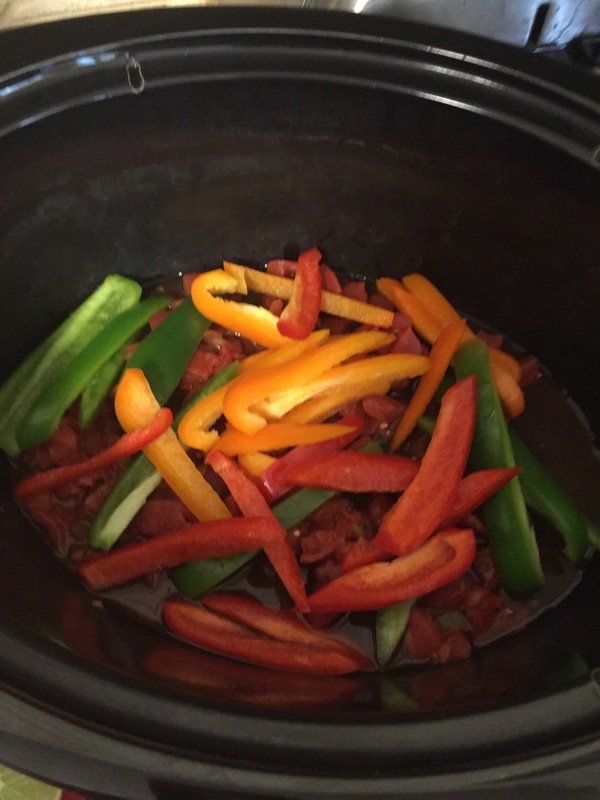 Either way…crockpot fajitas seemed like a nice compromise. Let’s just say I picked a crock pot recipe as a throw back to the 80’s. I didn’t, but let’s pretend I am that clever. So I bought some wholly guacamole and sour cream to make these just right. My oldest, BHB, is home from school for one last day after a bout with walking pneumonia and he insisted I serve rice and beans as the perfect sides to these fajitas. Happy to see him getting his appetite back, so I gladly obliged. 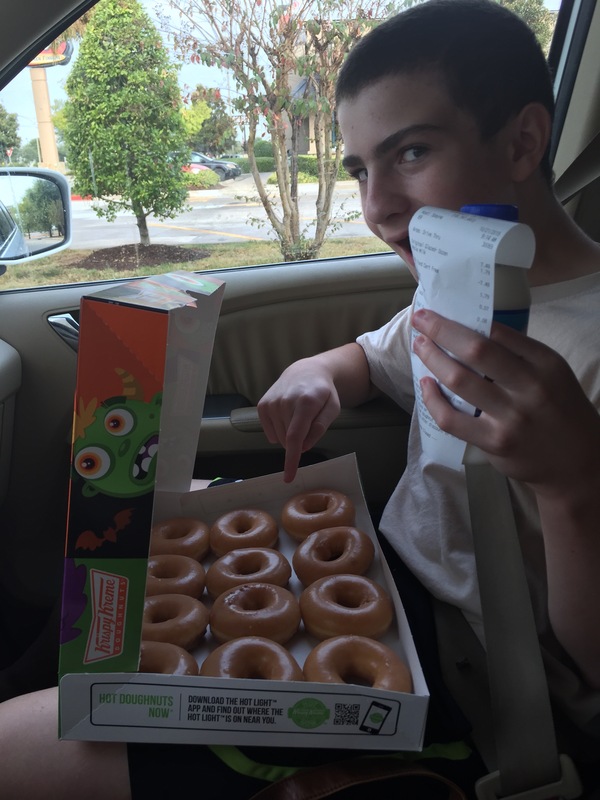 indulging in hot krispy kreme donuts, yeah, he is feeling more like himself. so glad!! So crockpot fajitas, rice and beans it is!!! 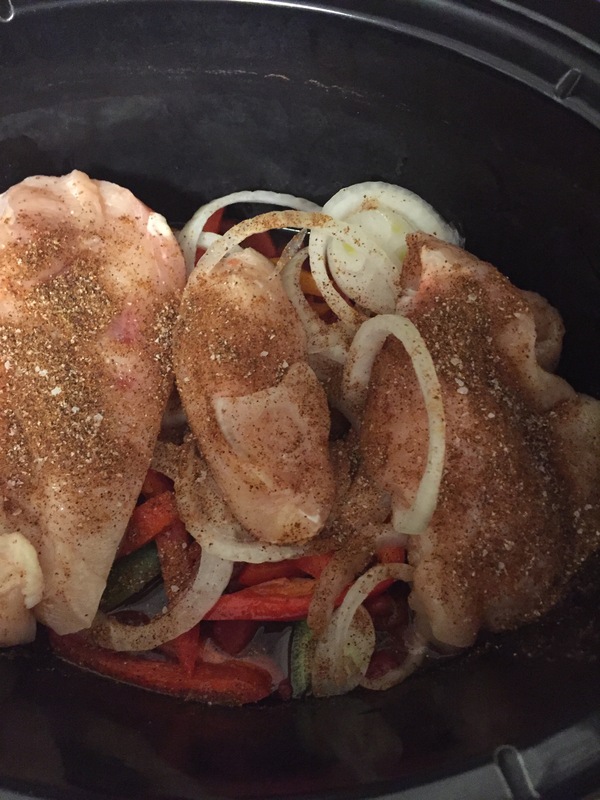 I found the recipe I used can be found here…Slow cooker fajita recipe . My fajitas are cooking now, so no final pic yet. I can smell them as I type and man they smell terrific. I cannot wait! So let’s get to it so you can enjoy some too! In the present or the future…or will it be in the past now? Pour one can of Rotel into the slow cooker. Next layer half of the sliced bell peppers and onion. Add the garlic to the mix too. Now add your chicken breasts on top of this. and then sprinkle half over one side of the chicken breasts. Cook on low for for 6-8 hour or high for 3-4 hours. Cook until chicken is cooked through and veggies are tender. Now if you want to be able to slice the chicken breasts, err on the side of cooking them a shorter amount of time. This is according to original recipe poster. You can shred the chicken too. Just be aware that at a certain loon the chicken is too tender to slice and shredding is only option. I cannot imagine that’s a bad thing. Anywho, remove chicken breasts from slow cooker and slice or shred. Ladle out 1 cup of liquid and discard. In a bowl, whisk together lime juice and honey. Return the chicken to the slow cooker and pour the luscious honey lime concoction over the veggie Chicken mixture. Give it a gentle stir and season to taste if you think it needs it. Serve in warmed tortillas topped with the fixins of your choosing. Fa-ji-tas!!! From the slow Cooker. Ah the future is indeed NOW! Now to get some Pepsi to drink with our meal. Ah I miss the 80’s!!! Happy Monday!! Ever feel like this about Mondays? Yeah me too!! It’s been an interesting weekend and I am actually posting from our beloved pediatrician’s office. So I think that automatically makes it an extra fun Monday!!! My daughter fell during our water hose fun the other day and hurt her tailbone. The pitiful thing laid on the couch most of Saturday and all day yesterday and she is typically a blur of motion. Just to be sure it’s not broken and for her (and my) peace of mind we are at pediatrician’s office to get an x-ray. Some days it’s hard to get real jazzed up about much and Mondays are sometimes that day for me. 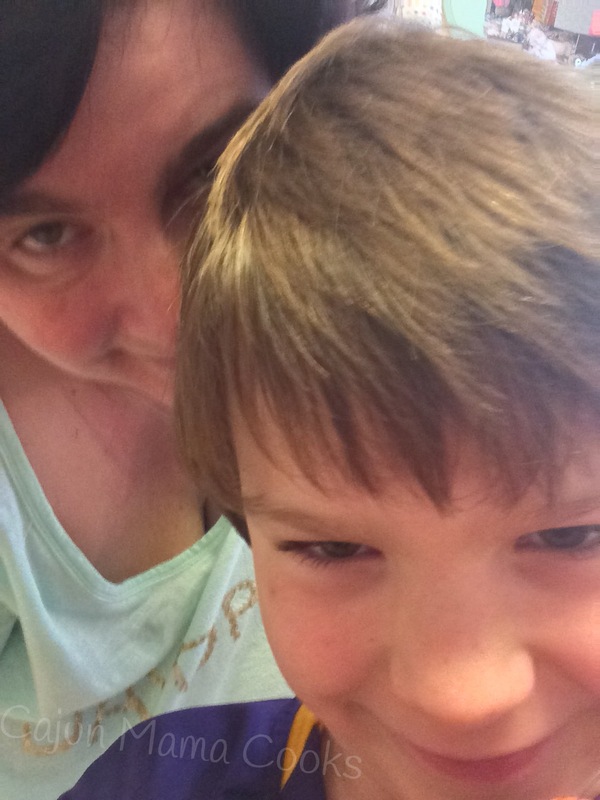 My cup of coffee with my oldest and Roozie in my lap are both things I treasure but still Mondays are a stretch. I wanted to maybe enter a little excitement into your lives (assuming a great recipe can do such a thing for you as it does for me). It’s my Monday morning gift so to speak. Which is really a gift itself. To get up this morning and have a whole new week full of possibility stretched out before me. All the opportunities, the blessings, the joy. Even another visit to the doctor’s office where we are among friends is a blessing. Thank God for insurance and a great staff full of awesome people to take care of my kiddos even if this is the 3rd visit here in a week. Anyway, I was very impressed with the creamy texture of this quesadilla filling and also how tasty they were. I will completely admit that my quesadilla making technique needs some work but I am a work in progress and that’s ok. I used my smaller round slow cooker and next time I will use my bigger oblong one. Also I washed the chicken breasts but in my haste to get them going I did not pat them dry and I think that made the filling a little watery. So lesson learned and they were still pretty awesome. I think these will work well for anyone who loves quesadillas without all the fuss and will be perfect for baseball families as I know this is the time of year for that. As the days get warmer, it is also a great recipe to have on hand to avoid heating the house up with the oven or sweat over a stove. I got you covered my baseball mom friends, hot natured friends, friends in the doctor’s office with no idea what to do for supper, friends who dislike having to cook…I have got you covered. Ain’t it grand? It’s the little things friends…never forget to give thanks for the little things and another Monday morning. Add (washed and patted dried) chicken breasts to the slow cooker. Add all other ingredients to the slow cooker. Cook on low for about 6 hours or high for 4 hours. Remove chicken and shred. Add back to slow cooker and stir into other ingredients. Allow cheese to melt completely and give and few presses with spatula for good measure. Repeat with each tortilla to make as many as you need. Cut in half and serve along side sour cream, pico de gallo, and guacamole for an authentic Mexican restaurant experience!! Margaritas are optional…or are they? Ole! I am really bad about cooking according to my whims. If there is such a thing as cooking add, I have it. A recipe looks so good one day I decide it must be made then life gets in the way and the next day I am over it. Into the freezer goes the meat I had bought and hopefully the ingredients I bought are nonperishable. As bad as that seems, there is an upside to it. When you have been iced in and going to the store is not a good idea but you know the tiny people who live with you (and one big one) will be asking for dinner by days’ end…you get concerned. Unless of course you have the frozen remnants of a cooking add fit and you realize you still have that skillet steak in the freezer you never made. And because you never have an empty pantry (thank you God) you are pretty sure you have the other basic ingredients in there. It pays off sometimes to be me. A little flighty, easily distracted and like to be prepared. So last night when I realized the kids would be home another day, I thought oh my I best get my game face on. We already had pancakes and cheesy eggs this week and I am not certain it’s cool to do that twice in a row. So big daddy brings up this skillet steak that had been there a while and I conceded that it was time to cook it. So we took it out to thaw and this morning it was on. That’s the up side to not being able to run to the store. It needs to happen sometimes. And it’s nice to be reminded of how much I already have. We, I have enough. I found the recipe I had saved on Pinterest and I set to work. It could not be easier and I have sampled it already…it tastes so good. And better still, the house smells so fantastic when you walk in from that icy cold air and step inside. Yum. So if you can get to the store today and get the stuff you don’t have…there is still time. It cooks so fast. Another bonus is that this is not an expensive recipe to make. I bought skillet steak because it was on sale but you can buy cubed steak. Whatever works. Throw in a veggie and a starch and voila…a hearty supper that is easy on the wallet and will warm your family from their head to their toes. Cut your meat in to serving size portions. Mine was already like that but just in case. Place meat on the bottom of your slow cooker. Layer if necessary. In a medium size whisk together the soups and soup mix and water. Pour this over the meat. 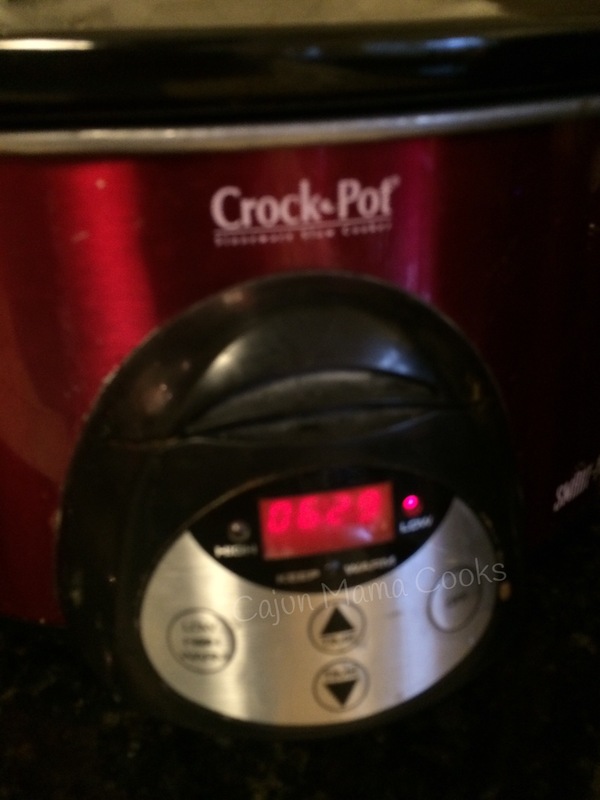 Cook on low for about 6 hours depending on your crockpot. Done. looks pretty good, doesn’t it? 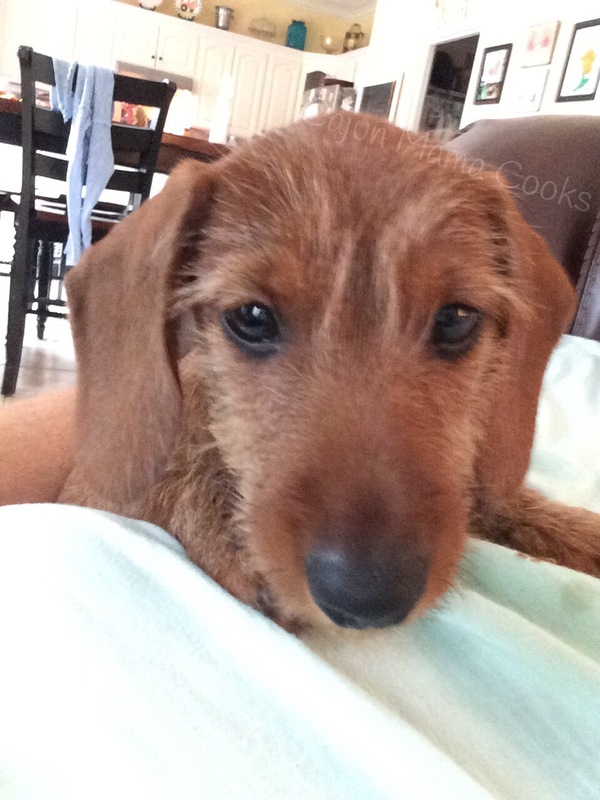 So first off, let me explain the reasons for my 2 week hiatus from blogging. 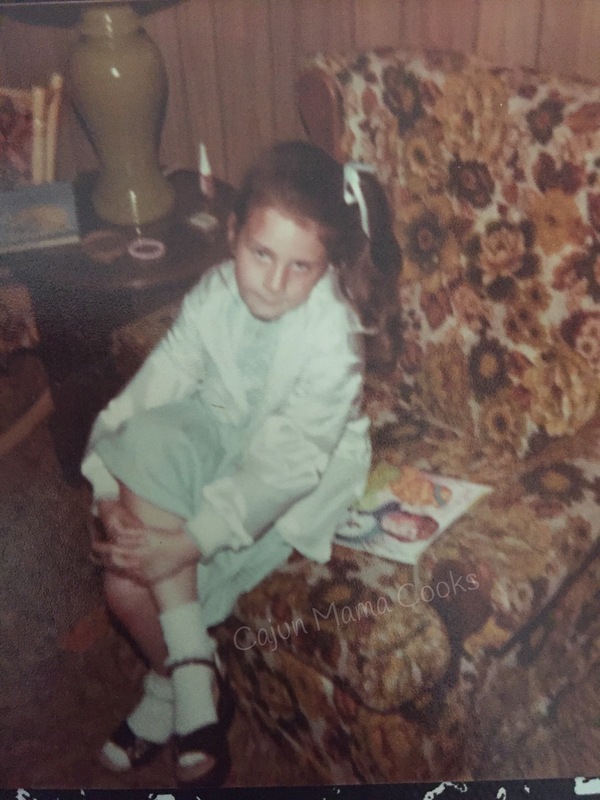 I could go into details about the where’s and whys of it all…but truthfully it’s about what you would expect from a mom. 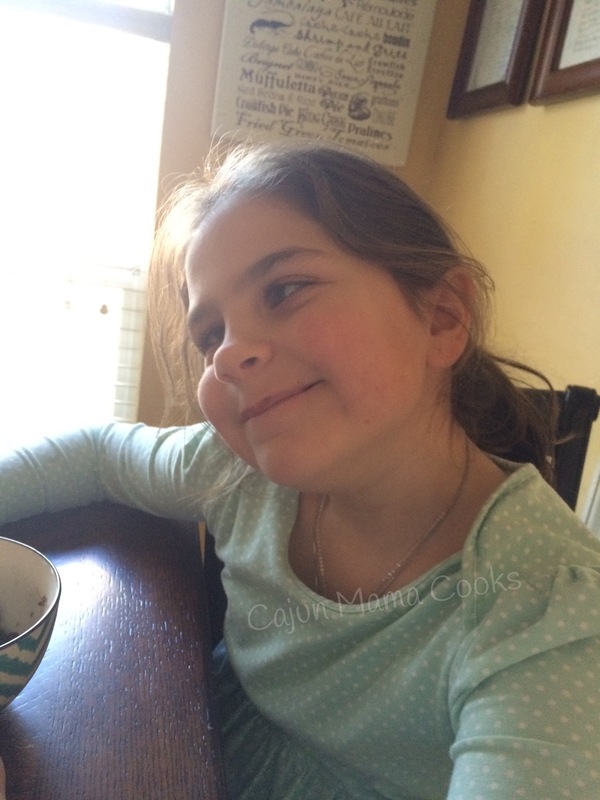 But most of all, there have been no recipes to blog because I have not been cooking and I have just been stupid busy with child rearing and carpool and trying to keep it all together. And frankly, I am barely managing even now. Sure, I get by. We all do most days, right? But man, these days I feel like I am running through the woods with my pants on fire, being beaten with reeds. (Yes that is totally a line from my all time favorite show…Designing Women.) Anyway, finding time to sit down and blog a recipe is a challenge sometimes and it is an even bigger challenge when mama ain’t cookin. But…I’m back!!! I hope you are ready to get in the kitchen and cook up some hella good recipes. The ones I have coming do not disappoint!!! Now today, I have a DELICIOUS soup recipe. I found it on http://lecremedelacrumb.com. Ya’ll know I love soup right? I am seeing more and more that I may or may not have an addiction. I am intrinsically drawn to soup recipes. I am not sure why that is. I guess because it is relatively uncomplicated. Maybe it’s the comfort a bowl of soup provides, especially one a blustery winter day? Make some cornbread or rolls and you have supper!! Chili and a pot of beans definitely fall in that same category in my heart. I guess it’s no mystery that I would crave a meal that is simple and comforting. No wonder why I would fix things for supper that lead to feel good, warm fuzzies. Life gets crazy and chaotic, goes at warp speed and I am constantly looking for ways to soften the blow. My life is by no means awful, so let me make it clear…I am not complaining. But I am above all practical and realistic. I have people who need to be fed every evening and what I feed them may as well taste good and maybe even pack a nutritional punch, without reinventing the wheel or require I dirty 10 pots and pans (though Lord knows I do that too sometimes). And maybe that is the reason in the nutshell I simply ADORE soups. They are practical. And this recipe is a real pleaser from the ease of getting it started (which for me is the biggest challenge sometimes) to the taste it delivers…it is pretty wonderful. So maybe if you are looking for a good recipe to try, out this one on your “to try” list. Optional…bacon bits or green onions for serving. 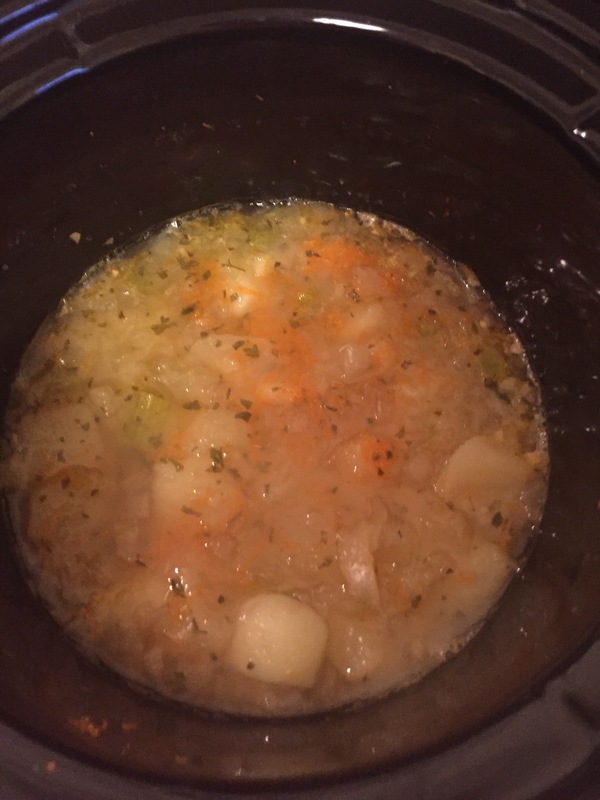 In a slow cooker, add potatoes, celery, carrot, basil and parsley and chicken broth. Give it a stir and then cook it on low for 5-6 hours or high for 3-4. Ok! 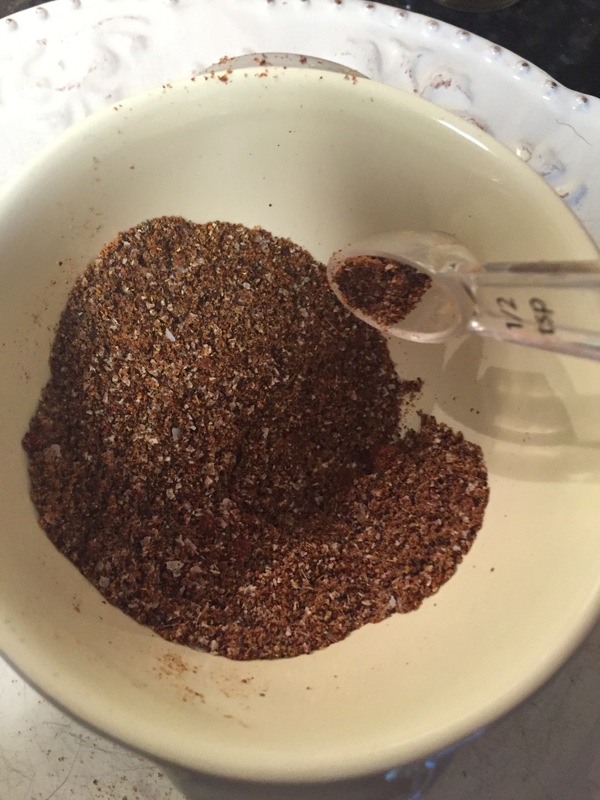 Now, about 30 minutes before you are ready to eat, brown your ground meat (which you can ABSOLUTELY do ahead of time). In a separate skillet, melt your butter. 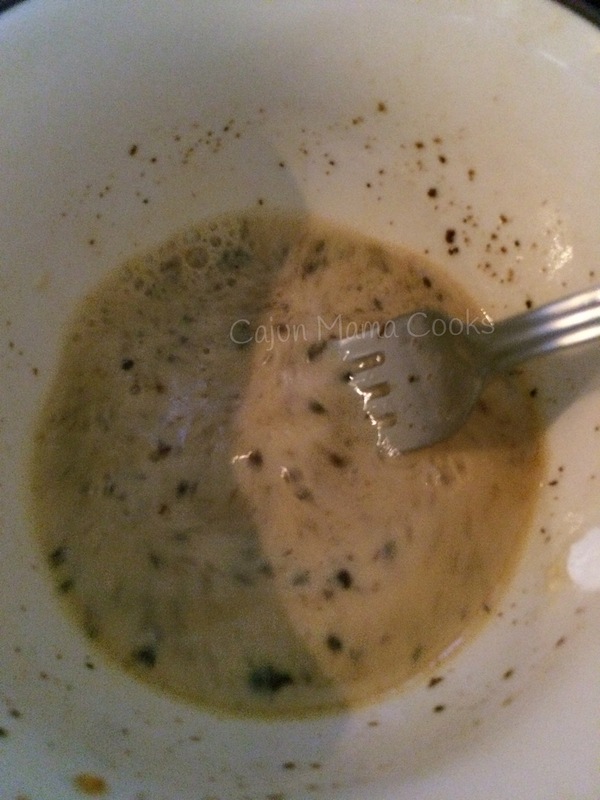 Whisk in the flour and stir until the flour and butter are combined…a nice light roux or blond roux if you will. 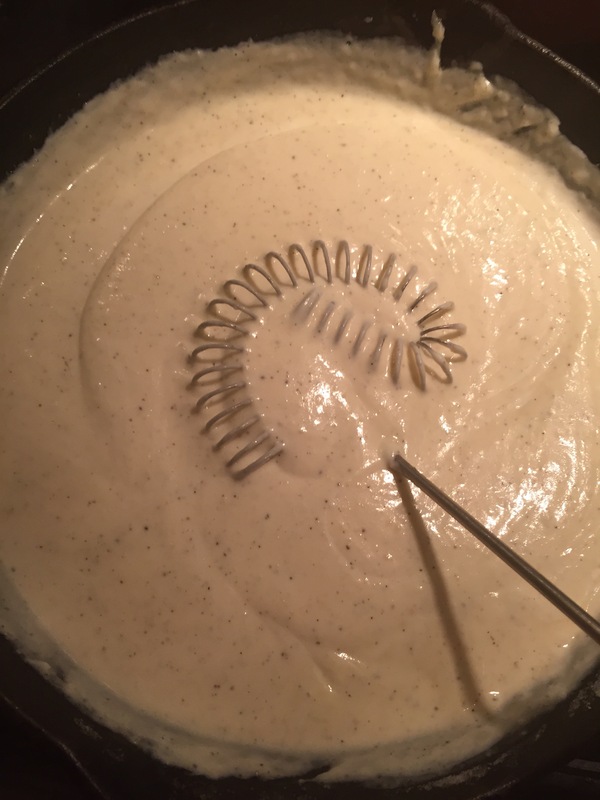 Whisk in the half and half OR heavy cream. Let it come to a bubbling simmer and simmer until the mixture is thick, creamy and luscious. Remove from heat. Stir in the garlic powder, salt and pepper. Now, add the sour cream to the mix. Mmmmmm…. 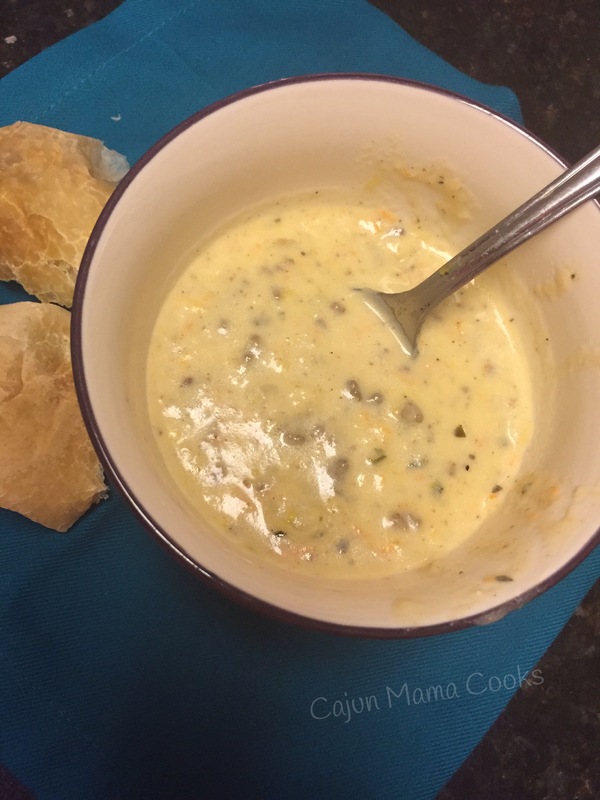 oh creamy goodness…you will make this soup so yummy. Now you are almost at the homestretch!! Stir in the browned ground beef and the creamy mixture into your crockpot. Stir in the shredded cheddar. are you picking up on how delish this looks?! Now, put the lid on the crockpot and let it cook on low for about 30 minutes. I served this soup with some frozen rolls that I just thawed and allowed to rise and then baked. My precious 9 year old aka my sugar cookie, absolutely devoured this. 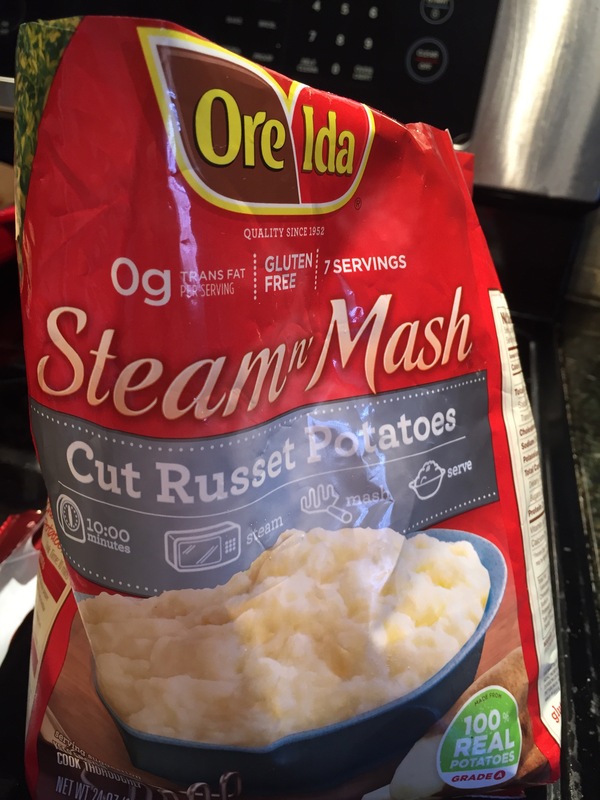 I loved it and found it to be as comforting and yummy as I wanted it to be. I hope your peeps love it as well!! Enjoy my friends!!! Another week has flown by and I have not been feeling the whole cooking thing lately. Crockpot, microwave, on the stove or otherwise…not. feeling. it. Shame on me I know, but it is what it is. So I knew I needed to get these crockpot recipes posted. I mean…as it is crockpot week has gone into crockpot month. It’s time. I know it’s time. So this past weekend I decided the week of Thanksgiving was likely the perfect time to trot these crockpot recipes out because who wants to cook a bunch of other meals before taking on the mother of all meals? The beast. So crockpot cooking all week before sounded fine to me. Plus we will all have to pick up the pace in the coming weeks as the holiday madness engulfs us, despite some of our best efforts. So Saturday evening, I set heaven in a crockpot to cook in the crockpot (quite aptly named, I can say that) and took the roast out of the freezer so I could put the beef for the beef and broccoli to cook the next morning. Well, little did I know how very glad I would be to have done that. I have not seen Momou in a while and I was yearning to see her. Needed to see her face. I was missing her, badly. So Sunday morning, I woke up and decided that was the day I would make the trek to AP to see her. Me and my kiddos. Plus, we would get to stop in Alex. to see my mom and dad. Awesome!!! BD was at Bayou LaGrue chasing after the ever elusive buck for the weekend and it was rainy and nasty, we were stuck inside anyhow…let’s do this! So we did. 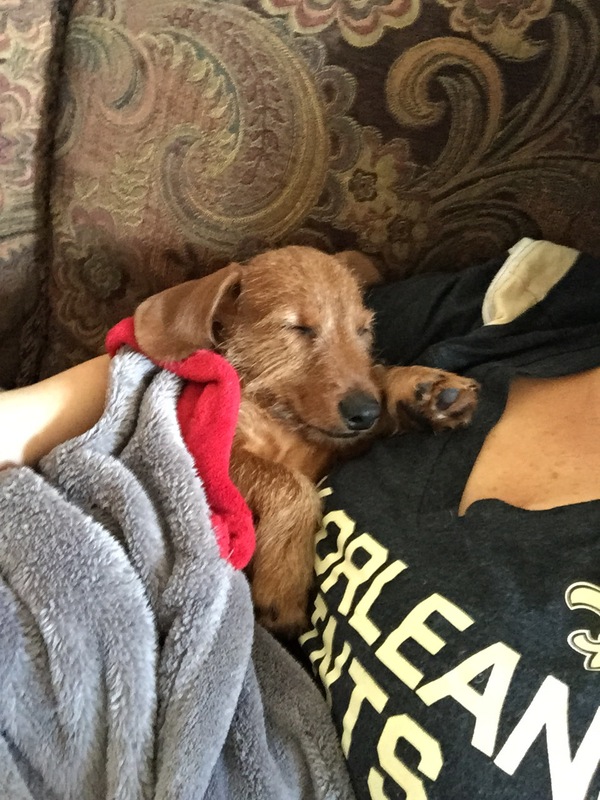 I left T-Roy in the hands of a good friend and her son…so I knew he would be happy. It was go time. But before leaving, I got that beef simmering away in the crockpot. I am not always a super duper planner…but I was on it that day. It was super easy to throw together. And off to AP we went. 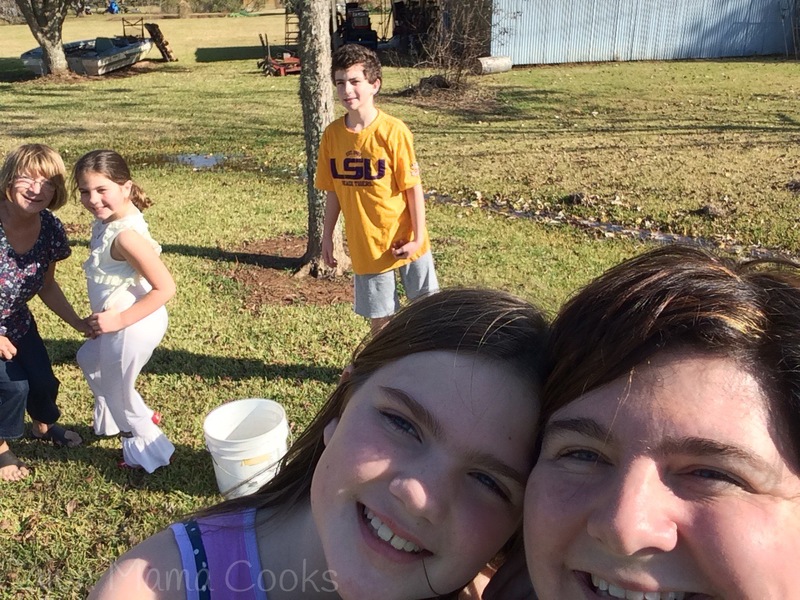 Here’s a few pictures from our Sunday…it’s amazing what all you can get done while the slow cooker cooks supper for you!! See what I mean…I am 2 hours away and still supper was cooking. Thank you crockpot with a timer!!! Ok now let’s get down to the brass tacks. The nitty gritty. The bare bones. Enough enough…here comes the recipes!! Both are very delicious and defy the laws of slow cooking. Are there laws? Idk. I thought it sounded good. The point is…they are both really yummy and absolutely worth the little time it takes to toss it all in. Tis the season to be crazy and tis the season to let the slow cooker do all the work! Toss the beef into your slow cooker. For this I used my 4.5 quart slow cooker. In a large mixing bowl, add the brown sugar, broth, garlic, soy sauce and sesame oil. 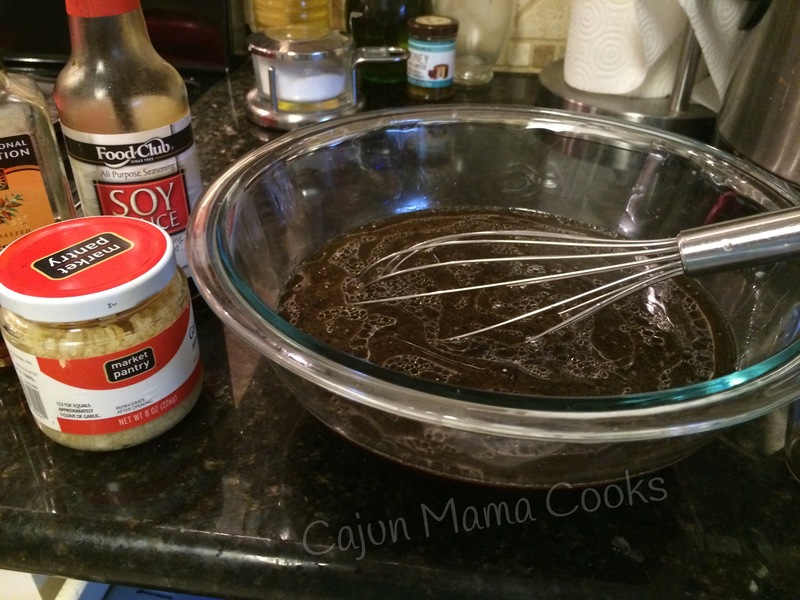 Whisk together…. And then pour over the beef. Cook on low for about 6-8 hours, depending on your slow cooker. everyone say it with me…set it and forget it!!! 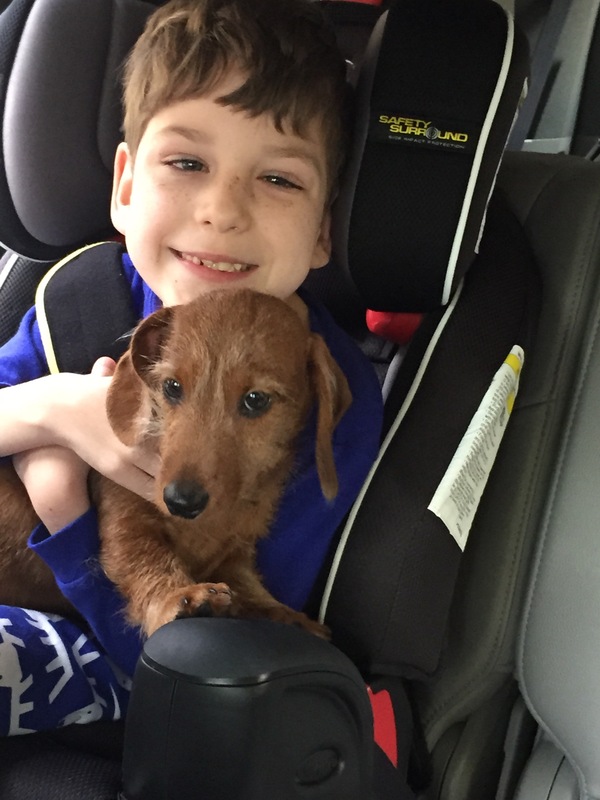 Now pack the kids in the car and head to Avoyelles!! Ok once the beef is good and tender, take a spoon and add some of that liquid to a bowl. 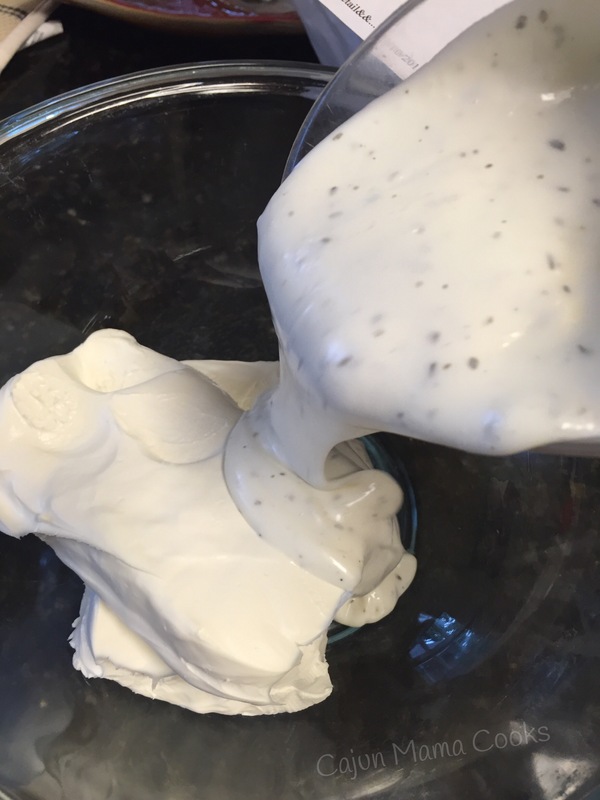 Whisk in the cornstarch. Remember if you doubled the sauce ingredient amounts, then double this as well. Now pour this mixture back into the slow cooker. Give it a stir. 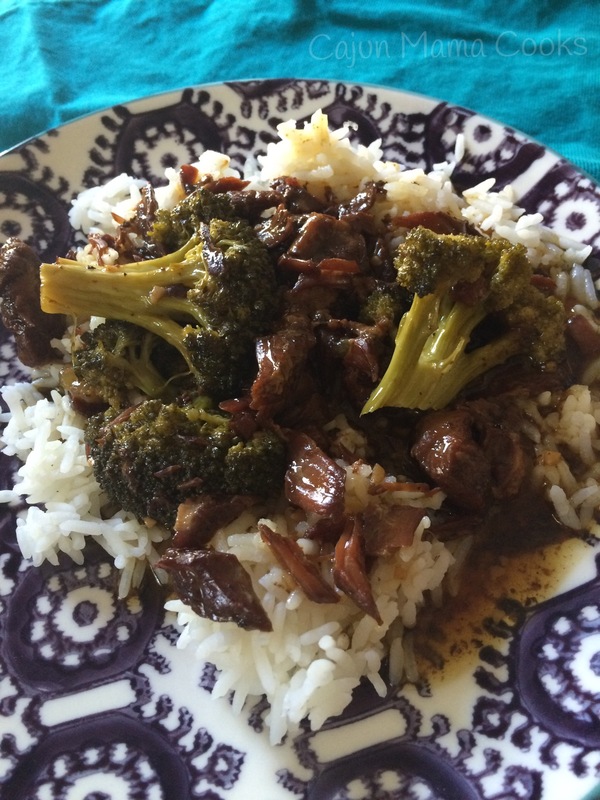 Now, add your broccoli florets to the mix. Cook on low for another 30 minutes. Serve over hot cooked rice. And you are golden. swoon worthy…or is it spoon worthy? Is cooking away happily right now, making the house smell so warm and homey. I will let ya’ll know the final verdict tomorrow and post a pic, but for now I will post the recipe. I found the recipe on http://www.allrecipes.com. After reading the comments, I took a few culinary liberties and made a few changes. We shall see. 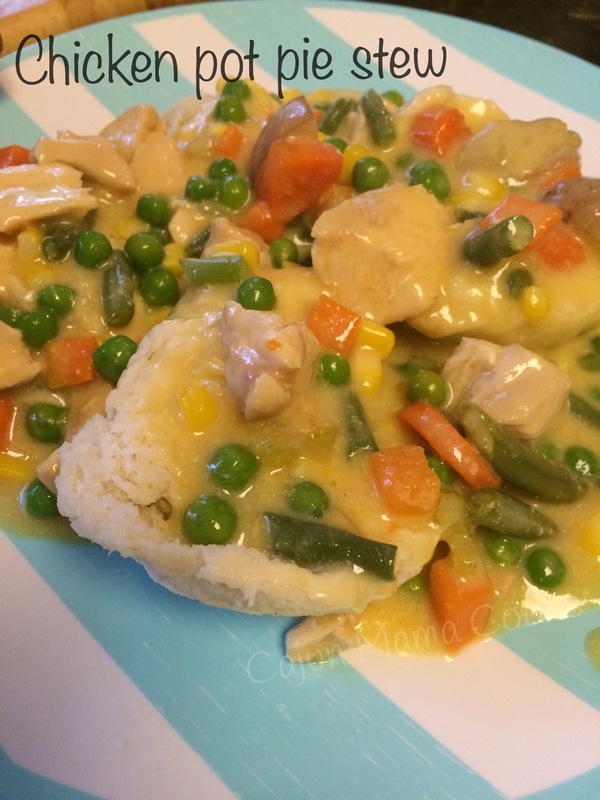 But the veggies are a part of the package and it is served over good ole buttermilk biscuits. I fail to see how this can go wrong. 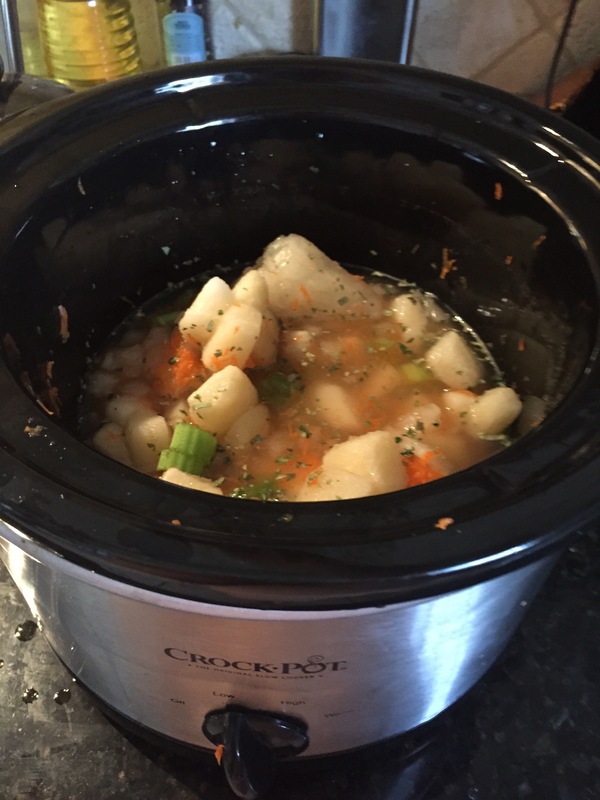 Add soups, bouillon cubes, carrots, potatoes, celery, cubed chicken and garlic powder to the slow cooker. Stir to combine. Cook on low for approximately 5 hours. Stir in frozen veggies and cook about another hour. Serve over freshly baked buttermilk biscuits. I am using the frozen Grands biscuits but you can use the canned ones as well. Or bake your own…if you are that good and have the time. Lol! I am not that good. Enjoy!! 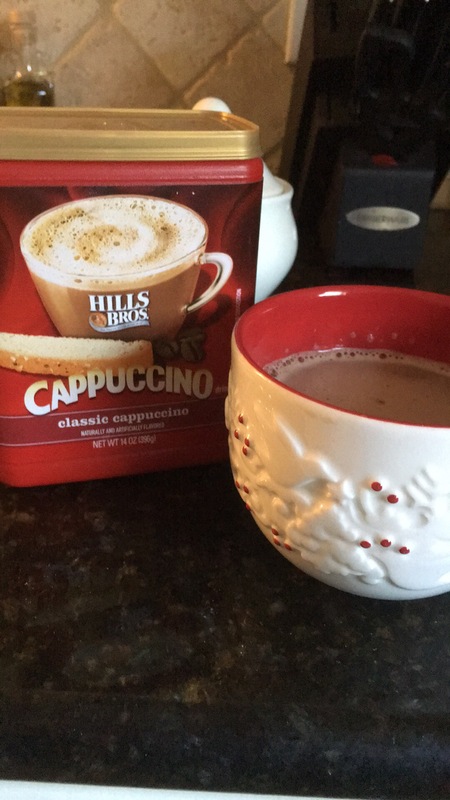 Update–this was absolutely delicious!!! It was a hit at our house!! Again, I would use a 5-6 quart slow cooker even if you don’t double the recipe. The ribs are a little bulky and hard to fit in there even when cut up some. But use your judgement. 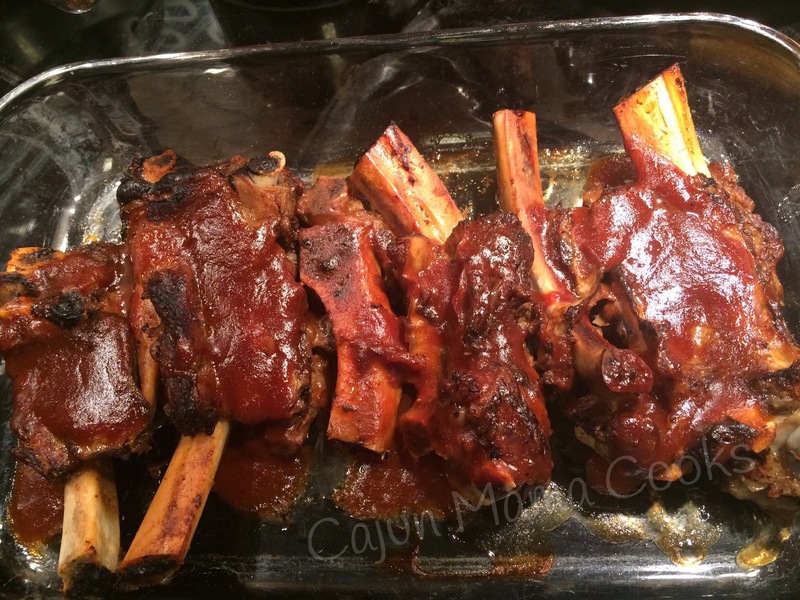 Cut ribs to fit into crockpot. Pour water and cooking sherry into crockpot. Lay ribs in slow cooker. Sprinkle adequately with salt and pepper. Pour barbecue sauce over the ribs. Cook on low for about 7 hours. The meat will be falling off the bone when they are done. When they were tender, I removed them from the slow cooker with a pair of tongs and laid them in a 9 x 13 baking dish and the smothered them in our favorite barbecue sauce. Clay’s daddy (Big Papa) has a friend who makes some barbecue sauce that is out of this world. It’s a thinner tangier sauce which is what we love. Anyway, put under broiler on lo for about 5 minutes or so to give them a nice caramelized look. Delicious! Three cheers for ribs on Monday night. Yum!